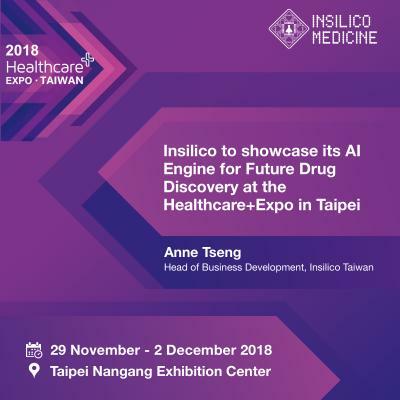 Monday, November 26, 2018 – Insilico Medicine, a Rockville-based company developing the end-to-end drug discovery pipeline utilizing the next generation artificial intelligence, will present its latest results in modern and next-generation AI for Drug Discovery at Healthcare+Expo Taiwan on November 30, and will host a joint exhibit at the Expo with Development Center for Biotechnology (DCB) in Taiwan, R.O.C. The presentation will give a detailed insight into how Insilico’s proprietary AI engine can help academia, pharmaceutical companies, dietary supplement manufacturers, and cosmetics companies in Taiwan, R.O.C. Insilico Medicine combines deep learning and big data analysis for drug discovery. The company is developing the end-to-end AI engine, covering the entire pharmaceutical drug discovery process, from hypothesis generation and target identification to drug design and clinical data analysis, radically increasing efficiency and shortening research schedules at the same time. While most of the AI startups focus on specific verticals and disconnected applications, Insilico’s AI engine aims to bridge the gap between biology, chemistry, and digital medicine with the single seamless deep learning pipeline, enabling Insilico’s AI scientists to solve previously impossible chemistry and biology tasks. Insilico Taiwan is working on the improvements of the AI engine, validating its molecular leads and expanding the company’s business into Asia. “The current drug development process is too expensive and inefficient. The average cost of just one FDA-approved drug exceeds 2.6 billion USD. Over 90% of drug candidates fail on different phases of clinical trials, making it very risky for pharmaceutical companies to develop drugs in an old-fashioned way. Applying AI to next-generation drug discovery will provide a revolutionary benefit”, said Artur Kadurin, CEO of Insilico Taiwan, R.O.C. Longenesis, a Hong Kong-based joint venture between Insilico Medicine and Bitfury, the world’s leading full-service blockchain technology company, will also attend Healthcare+Expo Taiwan to showcase its latest technology and demonstrate its emerging progress in genomics. Longenesis Ltd. offers the industry’s most advanced life data escrow system, built on the Exonum™ blockchain for security and powered with AI for traceability and smart data management. The company is currently launching in the genomics industry. “On behalf of Longenesis I am happy to share our technology solutions and accomplishments, as well as to explore the potential strategic partnership opportunities with Taiwan’s healthcare community and connect with the industry leaders”, said Daniels Petrovs, business development director of Longenesis Ltd. Mr. Petrovs emphasized that Taiwan’s healthcare market and its exceptional medical services are well-known and attractive to the global healthcare market. “Taiwan, R.O.C. is advanced in healthcare and medical technology, so we are eager to find strategic partners and to learn from Taiwan’s healthcare industry leaders,” he said. Healthcare+Expo Taiwan 2018 brings together hundreds of leading global biomedical and technology organizations. Featuring the theme “Med X Tech,” the Expo will attract a line-up of top global technology leaders who will share the latest technology advancements and insights into how technology can create better solutions for future medical applications. Longenesis is a Hong Kong-based software technology company that unites the blockchain excellence of Bitfury and industry-unique AI of Insilico Medicine, to deliver the world’s most customizable and secure platform for life data storage. It is now launching in the genomics industry. Longenesis provides the infrastructure for the storage of human life-sciences data, such as genome, blood tests, phenotypic indicators, etc. This revolutionary system allows data to be securely stored, selectively used for medical research and new drug development, and at the same time, fully controlled by the data owners themselves. Daniels Petrovs, Business Development Director of Longenesis Ltd.